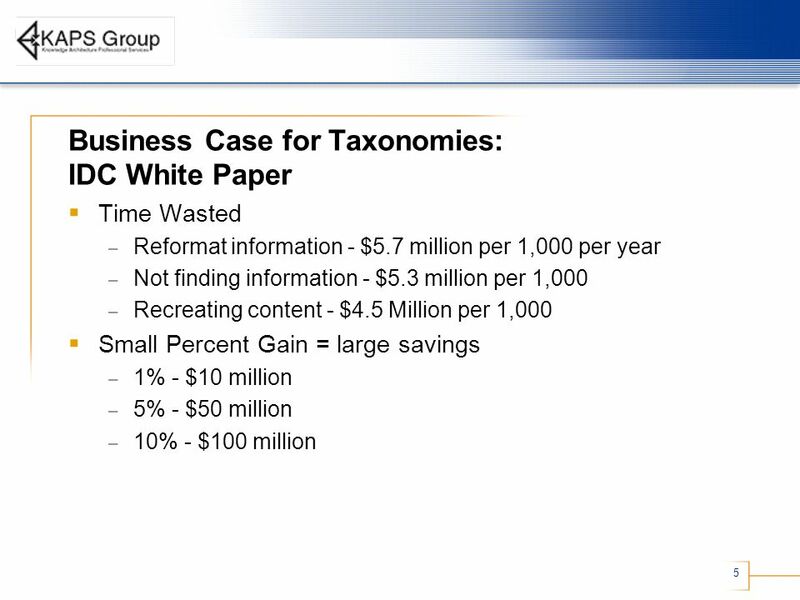 4 4 Business Case for Taxonomies: IDC White Paper Information Tasks – Email – 14.5 hours a week – Create documents – 13.3 hours a week – Search – 9.5 hours a week – Gather information for documents – 8.3 hours a week – Find and organize documents – 6.8 hours a week Gartner: Business spend an estimated $750 Billion annually seeking information necessary to do their job. 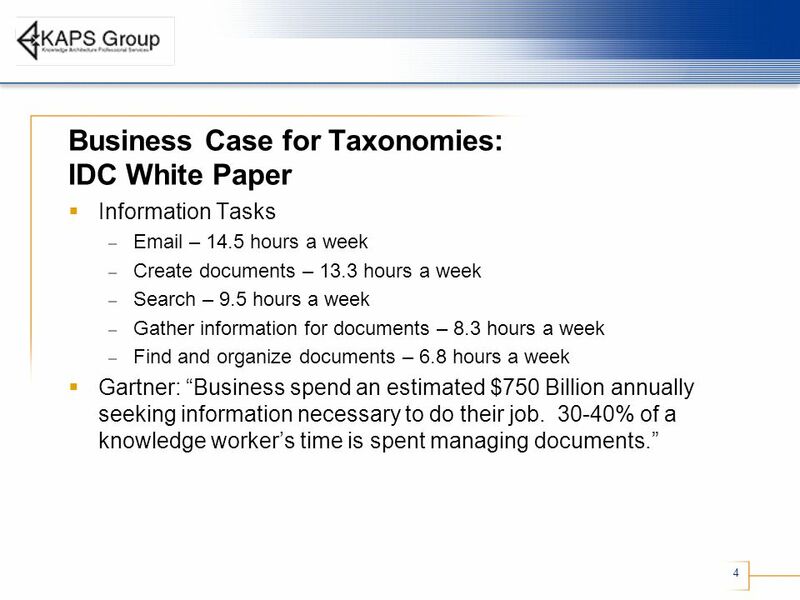 30-40% of a knowledge workers time is spent managing documents. 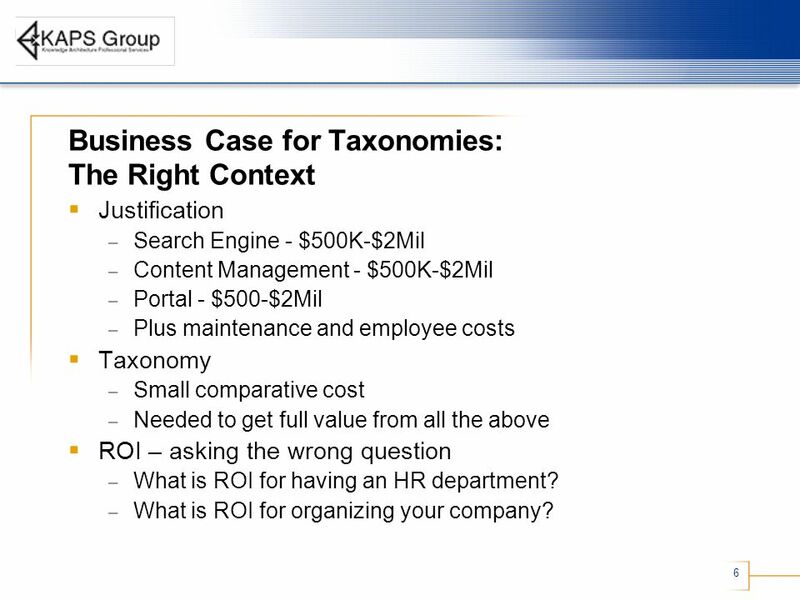 6 6 Business Case for Taxonomies: The Right Context Justification – Search Engine - $500K-$2Mil – Content Management - $500K-$2Mil – Portal - $500-$2Mil – Plus maintenance and employee costs Taxonomy – Small comparative cost – Needed to get full value from all the above ROI – asking the wrong question – What is ROI for having an HR department? 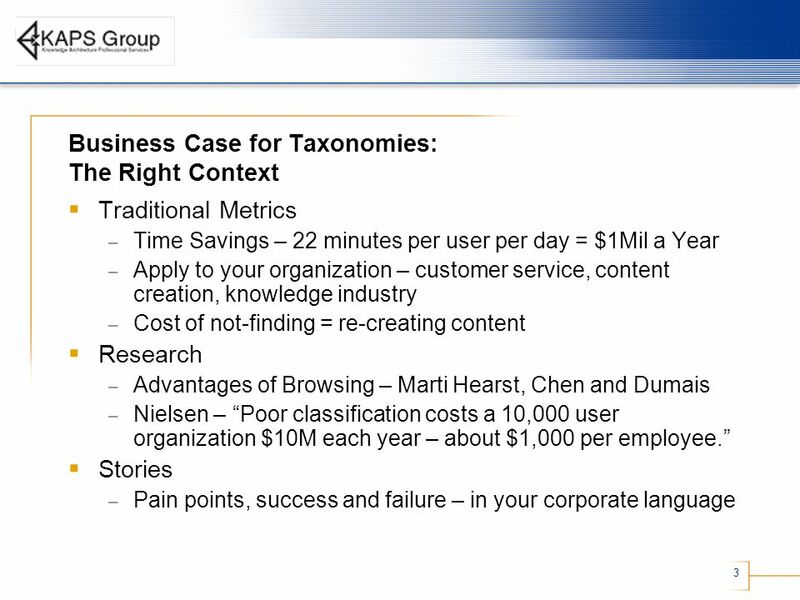 – What is ROI for organizing your company? 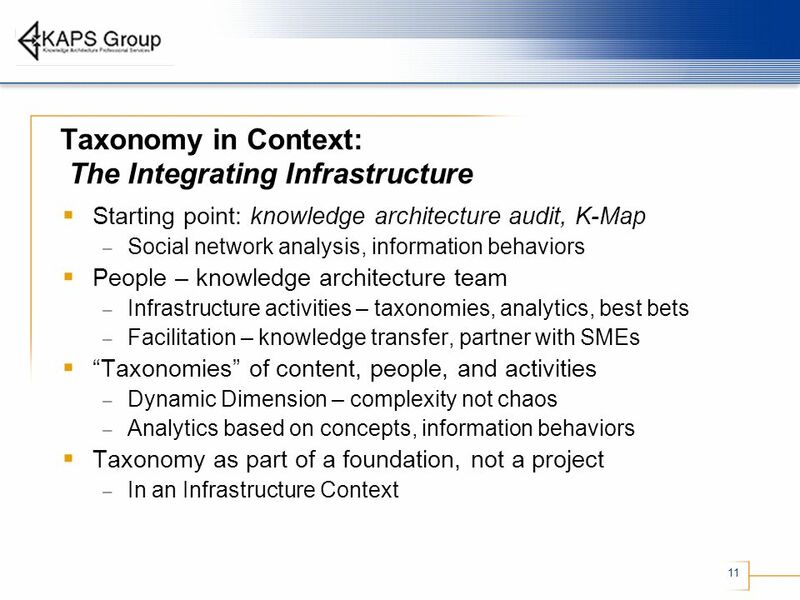 12 12 Taxonomy in Context: The Integrating Infrastructure Integrated Enterprise requires both an infrastructure team and distributed expertise. 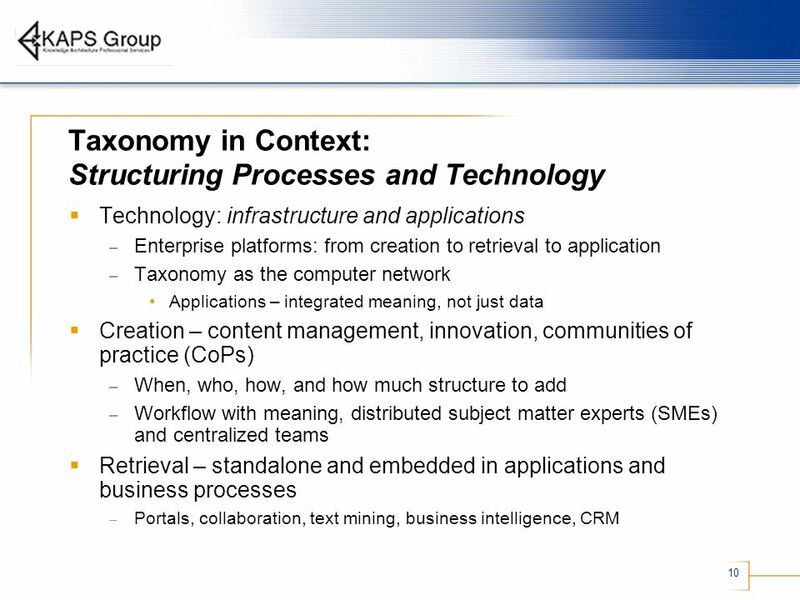 – Software and SMEs is not the answer - keywords Taxonomies not stand alone – Metadata, controlled vocabularies, synonyms, etc. 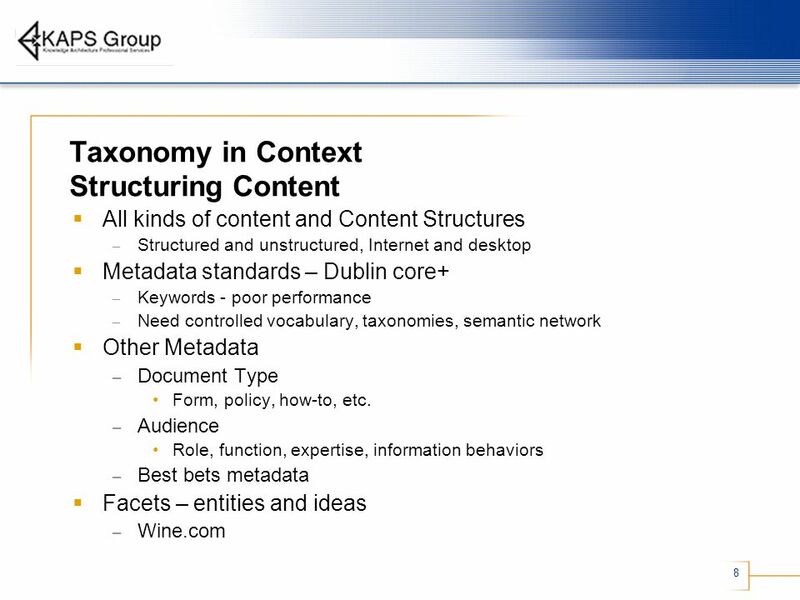 – Variety of taxonomies, plus categorization, classification, etc. 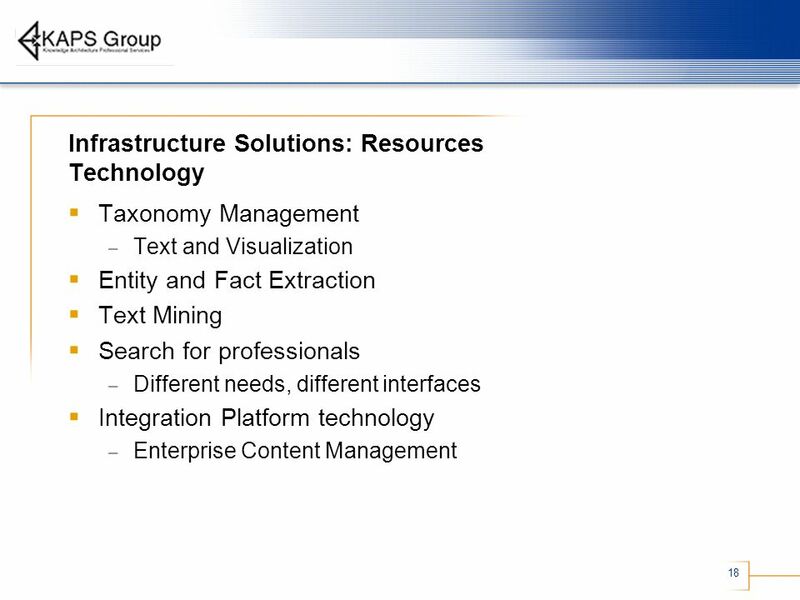 Important to know the differences, when to use which Multiple Applications – Search, browse, content management, portals, BI & CI, etc. 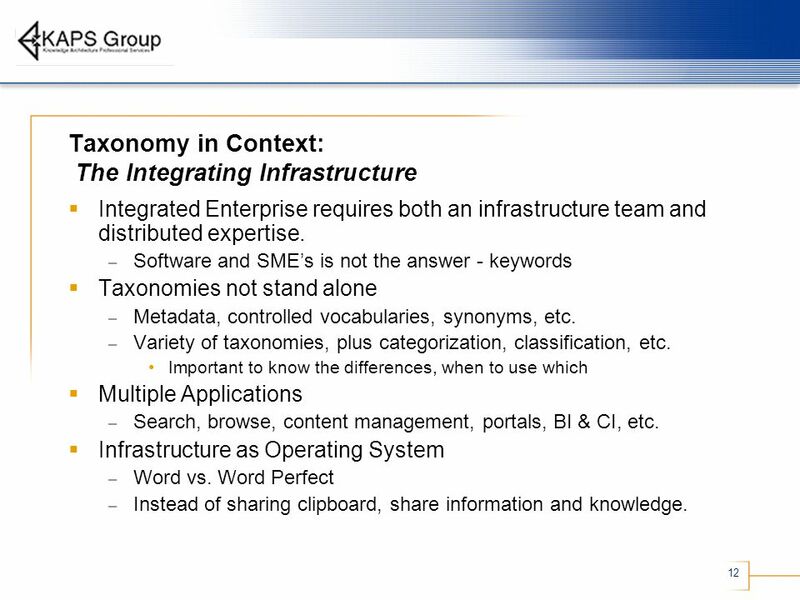 Infrastructure as Operating System – Word vs. Word Perfect – Instead of sharing clipboard, share information and knowledge. 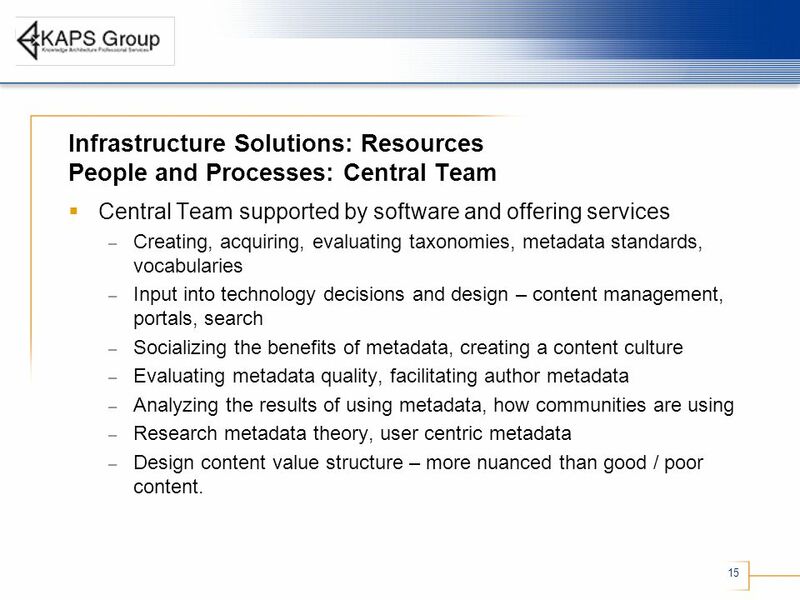 15 15 Infrastructure Solutions: Resources People and Processes: Central Team Central Team supported by software and offering services – Creating, acquiring, evaluating taxonomies, metadata standards, vocabularies – Input into technology decisions and design – content management, portals, search – Socializing the benefits of metadata, creating a content culture – Evaluating metadata quality, facilitating author metadata – Analyzing the results of using metadata, how communities are using – Research metadata theory, user centric metadata – Design content value structure – more nuanced than good / poor content. 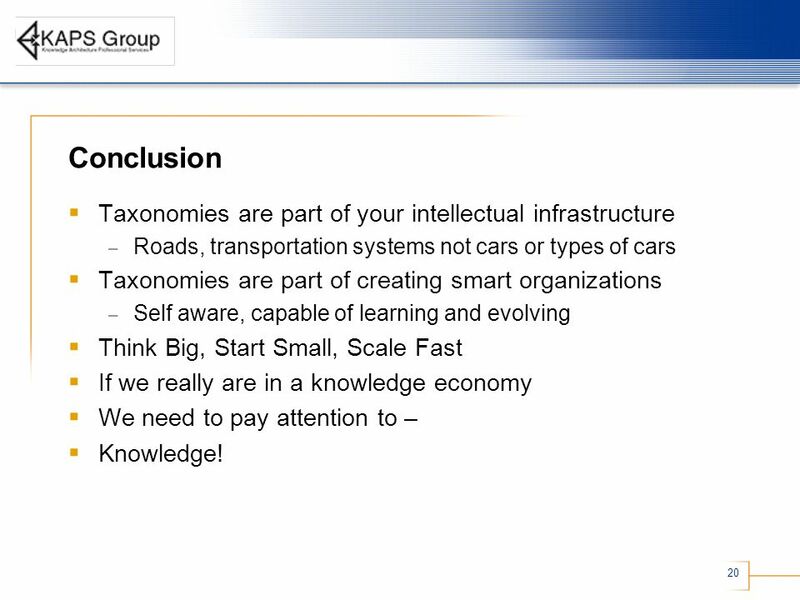 20 20 Conclusion Taxonomies are part of your intellectual infrastructure – Roads, transportation systems not cars or types of cars Taxonomies are part of creating smart organizations – Self aware, capable of learning and evolving Think Big, Start Small, Scale Fast If we really are in a knowledge economy We need to pay attention to – Knowledge! 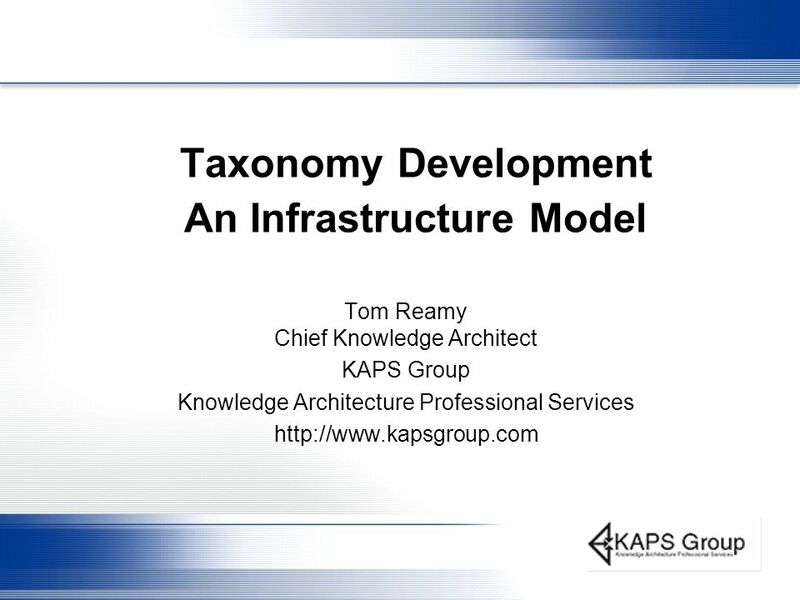 Download ppt "Taxonomy Development An Infrastructure Model Tom Reamy Chief Knowledge Architect KAPS Group Knowledge Architecture Professional Services"
Copyright © AIIM | All rights reserved. 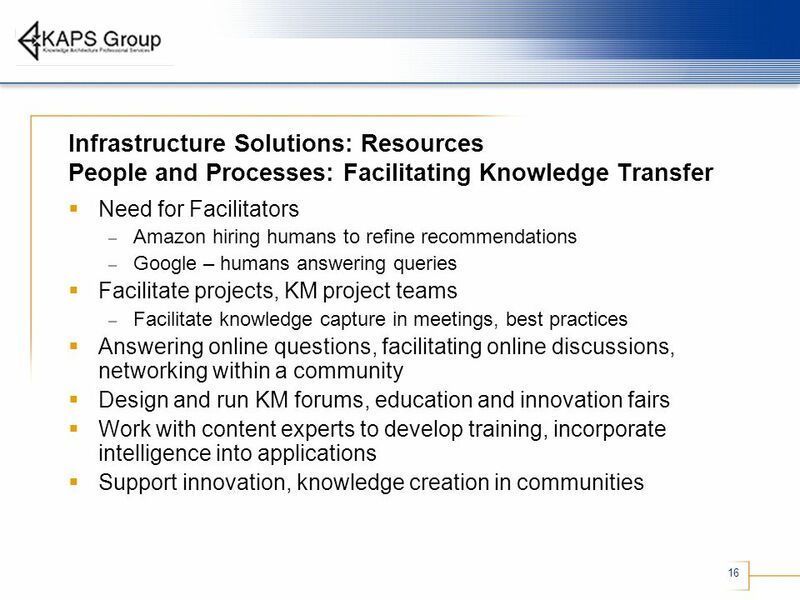 #AIIM The Global Community of Information Professionals aiim.org Information Management and Social Media Jesse. 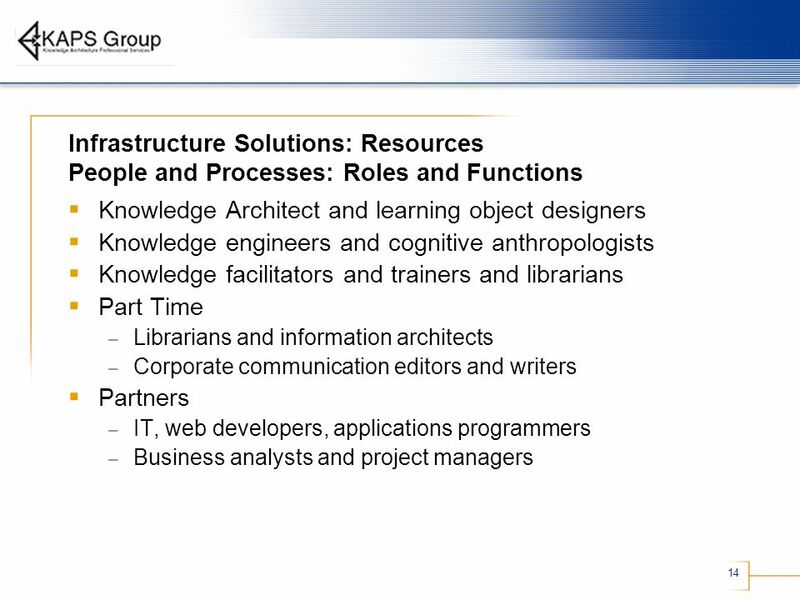 Knowledge Architecture People Designing a Knowledge Architecture Department Tom Reamy Chief Knowledge Architect KAPS Group Knowledge Architecture Professional. 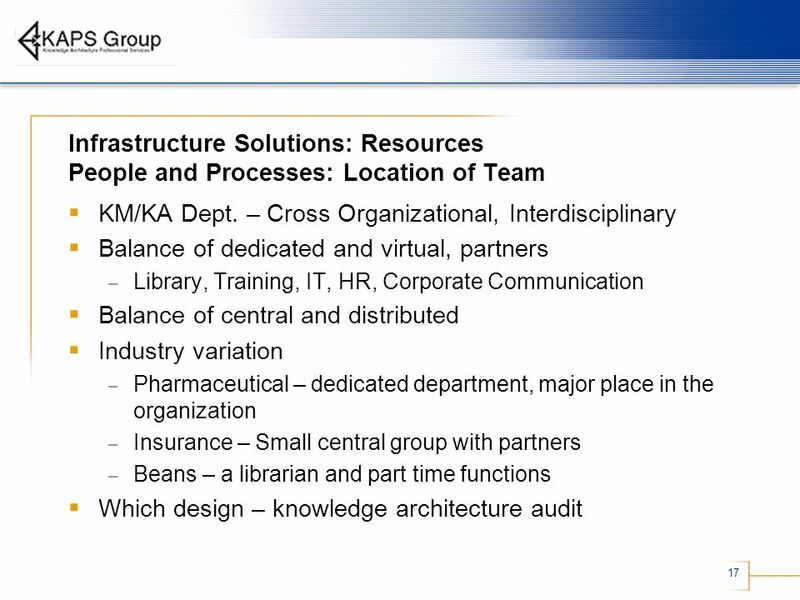 Metadata Strategies Alternatives for creating value from metadata Tom Reamy Chief Knowledge Architect KAPS Group Knowledge Architecture Professional Services. 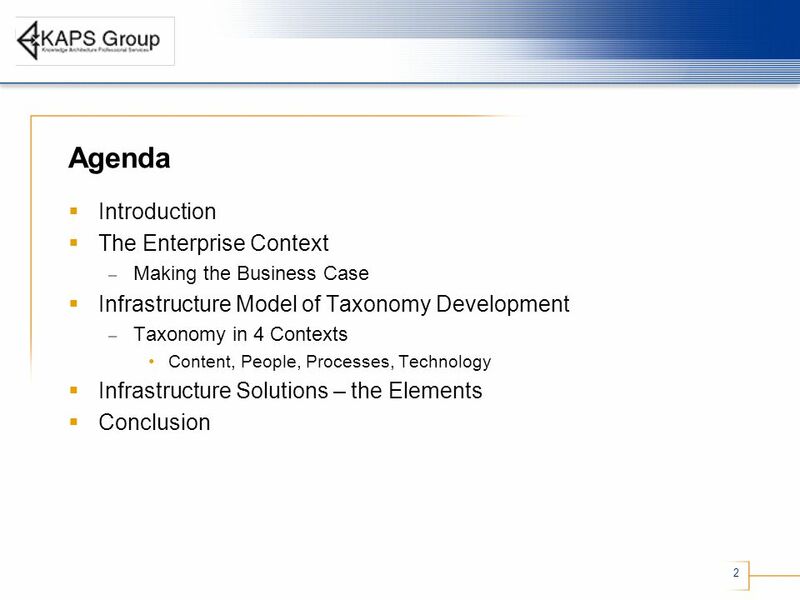 McGraw-Hill/Irwin © 2008 The McGraw-Hill Companies, All Rights Reserved Chapter 15 Creating Collaborative Partnerships. 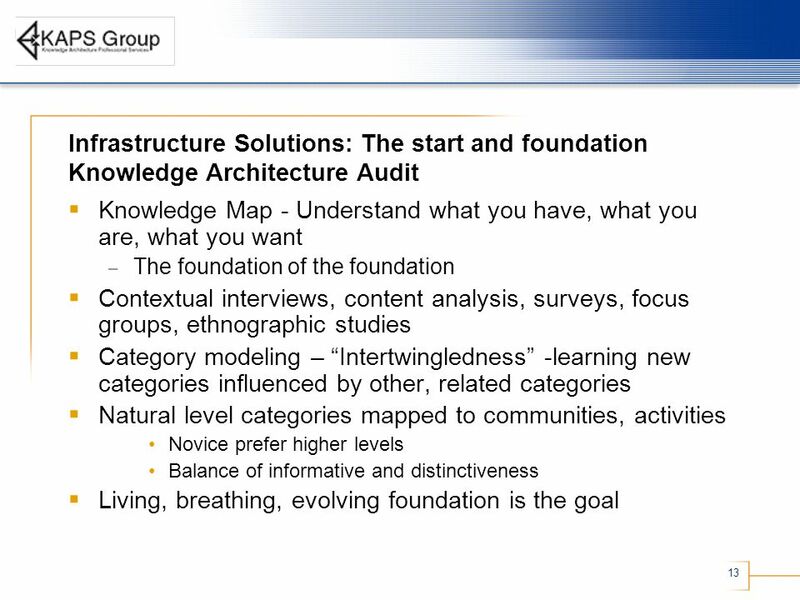 1.Data categorization 2.Information 3.Knowledge 4.Wisdom 5.Social understanding Which of the following requires a firm to expend resources to organize. 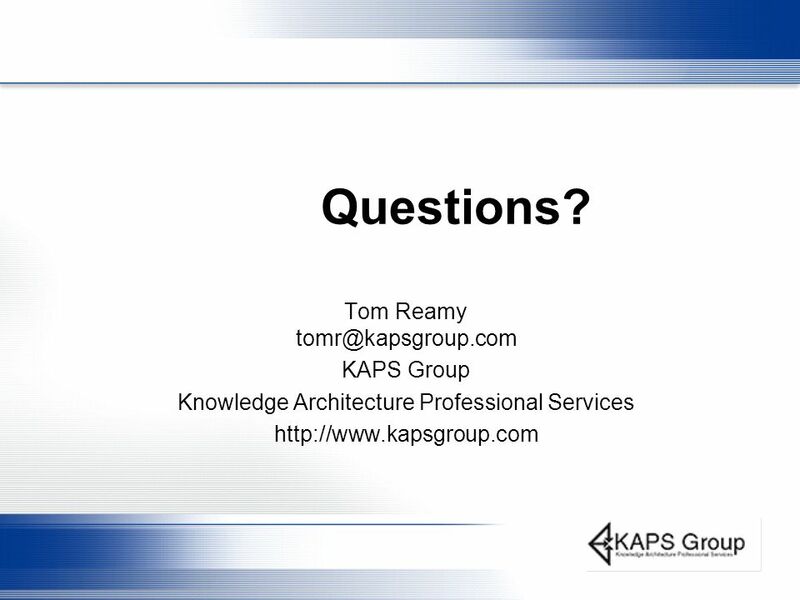 Enterprise Information Architecture A Platform for Integrating Your Organization’s Information and Knowledge Activities Tom Reamy Chief Knowledge Architect. 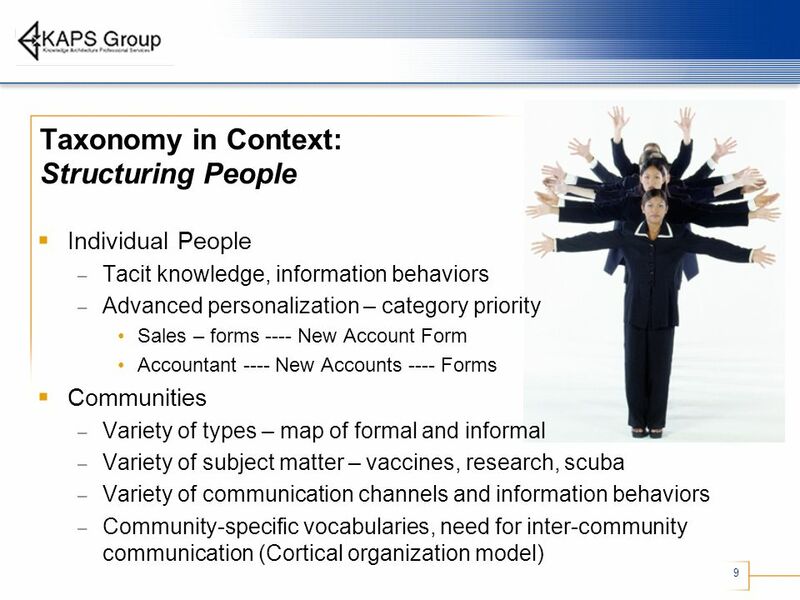 W w w. f a c t i v a. c o m © 2002 Dow Jones Reuters Business Interactive LLC (trading as Factiva). All rights reserved. 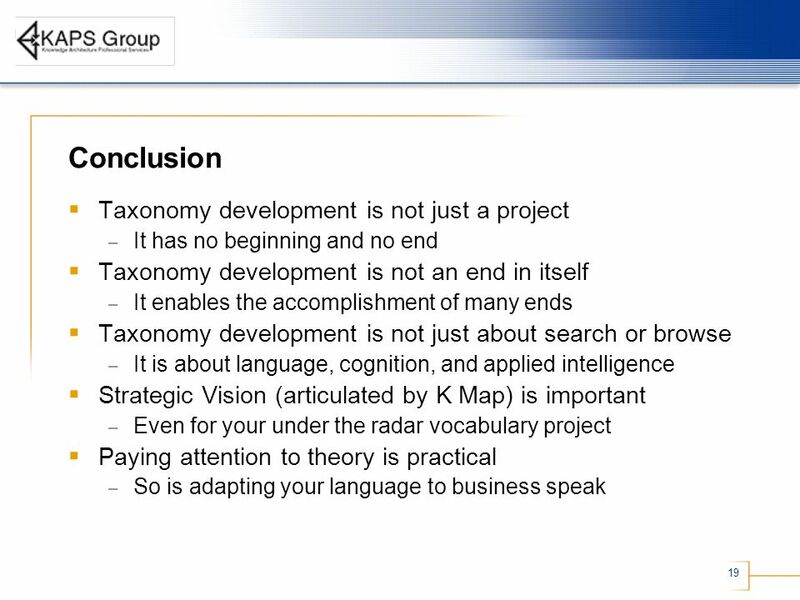 The Keys to Successful Strategic. 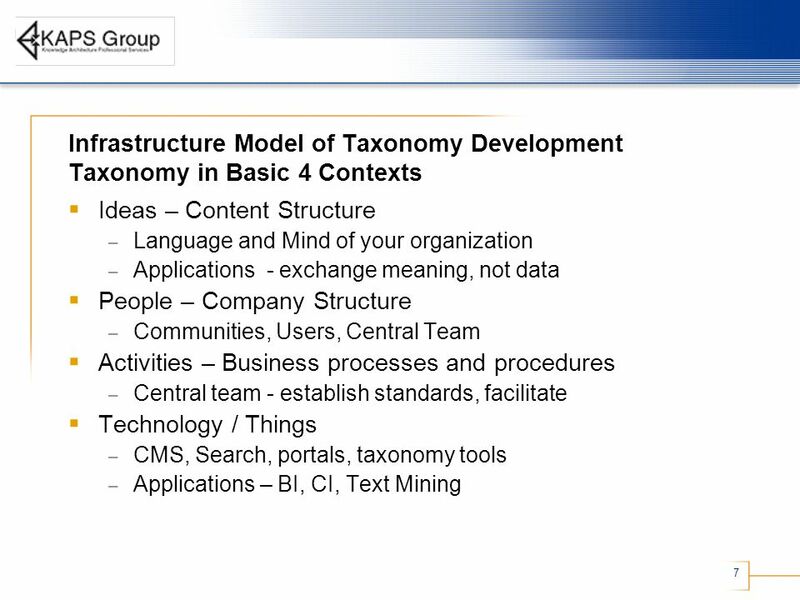 Third-generation information architecture November 4, 2008.